Staples' Keith Gelman checks Weston's Eddie Hutchins (25) during the boys varsity lacrosse game at Weston on Monday, May 3, 2010. In a battle of two undefeated neighboring teams, the Staples boys lacrosse team preserved its perfect season with a 10-5 win at Weston on Monday. Staples scored five goals in the first quarter and raised its record to 10-0. Weston dropped to 9-1. "Weston is a very good team and proved it in the fourth quarter," Wreckers Coach Paul McNulty said. "Our defense was excellent again. Our game plan was to control the ball and have good shots in the first quarter." Staples controlled the game in the first quarter with a 10-1 shot advantage. Junior captain Kip Orban served as an offensive catalyst. Orban (three goals, two assists, four ground balls) was deft in setting up the offense by feeding senior lefty captain Nate Greenberg and senior Jeff Kelly for goals in the opening quarter. He also opened up the scoring by going around the net and slinging one in with 6:46 remaining in the first quarter. "We had a lot of picks that allowed our shooters to get our hands free," Orban said. "We ran off of ball movement, which opened things up. I tried to feed my teammates and let it fly and it went into the crease." Scoring wasn't Orban's only strength. He also helped in the trenches and got his share of ground balls. "The ground balls were a team effort and a lot of guys wanted it," Orban said. "We had more blue guys than white guys fighting for the ground balls." Proof of Orban's statement was the Wreckers' 41-23 advantage in ground balls. Even when the junior captain didn't pick up the loose ball, he still played a role in his teammate coming up with it through his presence. "Kip Orban is the best player I've seen all year," Trojans Coach John Mathews said. Only 20 seconds after Orban opened up the scoring, he set up Greenberg's goal and with 6:09 left, Greenberg (one goal, one assist, two ground balls) set up Kelly's first goal of the game. Kelly (three goals) displayed some good moves to the net and scored two more goals in the quarter to give Staples a 5-0 lead after the opening quarter. He circled the net both times with Orban setting up the first. "I came out dodging and I looked for my shots," Kelly said. "There wasn't much of a slide when I beat my man and I let it rip." Weston junior goalie Alex Peyreigne (13 saves) prevented the Wreckers from further breaking it open by making saves on Kelly and junior Charlie Ross from point-blank range. Staples was especially effective on defense with junior Matt Yeager (14 ground balls) being all over the place. Whenever there was a loose ball, Yeager managed to scoop it up. "I think we worked as a team and you got to give credit to the coaches because they were able to prepare us," Yeager said. Yeager especially did a great job in shadowing Weston senior captain Robbie Cordisco. The speedy Cordisco normally wreaks havoc on offense because of his speed and athleticism and will be playing Division I lacrosse next year. However, he looked like a mortal and was limited to one goal and three ground balls because of the suffocating defense Yeager played on him and the support he received from senior captain Jack Ambrose, seniors Brandon Waiter, Keith Gelman, Seth Cadan and junior Greg Lewis. "I knew his strong side and I tried to take away his strong side and force him to his weak side and play conservatively on him," Yeager said. "I give credit to the team, Seth Caden, Brandon Waiter, Jack Ambrose, Keith Gelman and Greg Lewis helped out too." Ambrose (one goal, eight ground balls) was also a defensive force and played a major role in keeping the action away from senior captain goalie Austin Waiter (seven saves, three ground balls). "Our whole defense has great chemistry and without one of the links, the chemistry isn't as strong," Ambrose said. Brandon Waiter broke up many plays and rushed the ball out of the defensive zone frequently. Gelman and Lewis did a lot more than their statistics reflect and also prevented the Trojans from finding their offensive groove. Weston picked up its play in the second quarter with junior Kip McMahon (six ground balls) getting to some ground balls and rushing it out of his defensive zone. However, McMahon and the Trojans weren't able to get past Staples' impenetrable defense. The Wreckers still had the edge in play and outshot the Trojans 7-5 in the second quarter to finish the half with a 17-6 shots advantage. Orban scored the only goal in the quarter when he circled around the net and tucked it home with 15.3 seconds to go in the half. Things began to change in the second half with Weston finding an offensive groove. Senior captain Morgan Faller got off an early shot, only to be denied by Austin Waiter. Faller (two goals, one assist) set up sophomore Lyle Mitchell's (one goal, two assists) goal with 9:12 remaining in the third quarter. The lead fluctuated between five and seven goals after that with Ambrose and Orban scoring in the third quarter for Staples to make it 8-1. Faller scored from classmate Charlie Smith (one assist, one ground ball) and Cordisco circled around the net to score for the Trojans and it was 8-3 after three quarters. "What I'm most impressed with is that we stepped it up and didn't give up and the younger guys contributed," Mathews said. Both teams played well defensively in the fourth quarter. Weston senior Andrew Baron (one ground ball) had a nice check in back of his net and Staples junior Nick Makki (one ground ball) was strong in the trenches. Ross (one goal, one ground ball) scored from Gelman and senior Kyle Mendelson (one goal, three ground balls) scored from 20 yards out to make it 10-3. Mitchell set up goals by sophomore Jack Scheufele and Faller to account for the final. 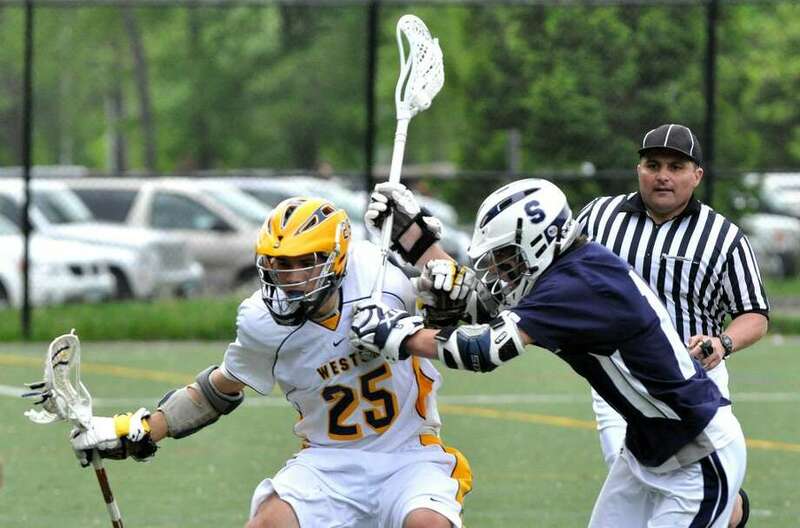 Senior captain Will Miller (six ground balls) led Weston's defense with some aggressive play. Classmate Brian Rogers fired three shots and senior Tucker Drimal picked up three ground balls for the Trojans. 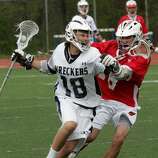 Also contributing for Weston were senior Ken Judge and juniors Evan Kleban and Ken Brooks with one ground ball each. Staples finished the game with a 23-17 edge in shots. "I was happy with our performance," Mathews said. "Staples is a great team and the best team we played and seen this year. They beat us in every aspect of the game and they are fundamentally sound. Staples will do a lot of damage in States. This is a great game to be battle tested in. Facing a better team than us will help us in SWCs and States." The Wreckers are confident this win will help them. "It gives us a boost and we hope to keep playing like this," Orban said. Despite its record, Staples isn't ready to celebrate just yet and knows there's work to be done. "We want to keep proving we can play with anyone and Weston is a good team," McNulty said. "We worry about one practice at a time and one game at a time and all we can control on our side in practices and games." Ambrose said, "We don't really care about our regular season record. After every single game, we're 0-0 and hope to be 1-0 after the next game."